Happy New Comic Day! It's a beautiful day for comics. But any day is a good day for comics. There are quite a few books I'm looking forward to including both G.I. Joe books, AvX #5, Winter Soldier #6, and Ultimate Spider-Man #11. This might be an average number of releases and I'm perfectly fine with that. There were several contenders this week, but in the end the winner was pretty obvious. Nothing against the others but come on, it's Spawn #220. Look at it. Yeah, you like it too. It's been 20 years since Image Comics was formed and it's been a ball. Todd McFarlane is apparently making his return to more creative duties on the title. 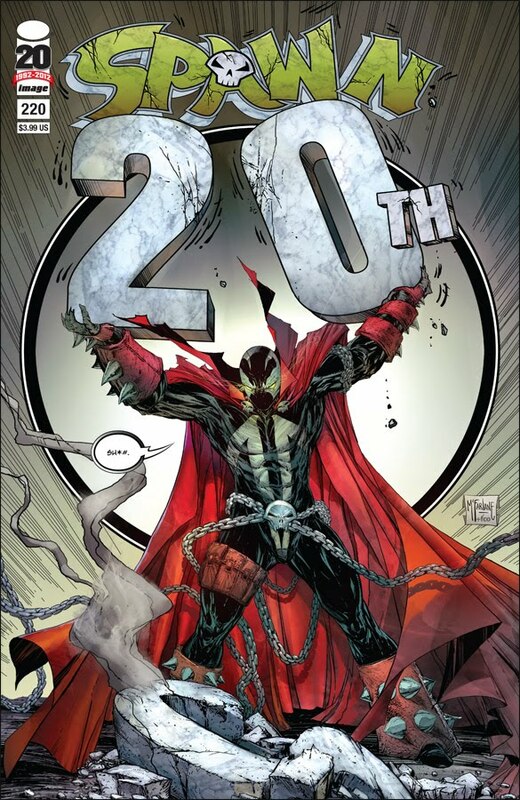 That includes starting with this nice cover showing Spawn holding up the "20th" sign. This books has been damn good and one of the top titles I look forward to each month. Can't wait to read this. What do you think about my pick? Let me know. Happy reading to everyone. SDCC 2012 Exclusives are Amazing!